BEFORE– Here is a photo of the den before I moved into the house. It had faux finished walls and saltillo tile floors. Kept the floors. 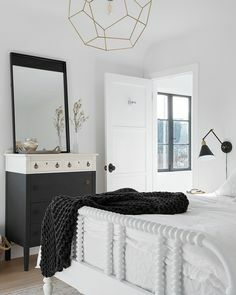 Painted walls white. When I moved into this house, the little den was being used as a guest bedroom. It had western themed faux finished walls – cute and part of what the owner was trying to do with the decor but too dark and not my style. I immediately painted everything bright white (Benjamin Moore Super White). I got a slipcovered sofa (with two different blue slip covers) and then decided to let the decor kind of come together. A few weekends ago, the den decorating got an injection of style when I had ten of rugs delivered to my house. The special thing about this delivery is that they were all rugs from my collection! Was soooo exciting to have rugs that I designed at my disposal for decorating my new spot. So I went on a rug switching out frenzy for one morning. This small blue + white den in the back of the house was privy to two rug swap outs and a few sofa slipcover changes. The color scheme in den is blue and white. The den is a work in progress…not done yet at all.I still need to hang art on the walls to make it truly cozy. Also, bestie AM says I will need some bold color added in. Okay so back to the work in progress in this blue and white den. Here are 3 looks ( or 4 … al kind of similar). Which would you pick? COCOCOZY Oxford Rug, navy linen slipcovered sofa, black coffee table, navy COCOCOZY Logo throw. COCOCOZY Glace Rug, navy sofa, black coffee table. Love the crystal blue color of this Glace Rug. This rug comes in 3 other colors. I will be trying a few of those out too! This one…I mixed up the sofa instead of the rug. Mix matched slipcovers to make a two toned sofa. What do you think! Was so fun using items from my collection in my house. Right now the Glace rug in crystal blue is in the den. I also have red rug that I will try out this coming weekend. Please weigh in…let me know which look you are leaning towards. Next up…art…maybe even some window coverings. I love look 3! That rug is awesome. Love all your rugs, but three works best because of the scale of the design. Great house! Definitely not the two toned sofa. Navy sofa and glace rug is my pick! Simpler, cleaner, more sophisticated. Definitely look 1!!! Comfy, cozy and yet sophisticated.